The family members have attended more than a dozen of the monthly commission meetings since Stokes was killed nearly five years ago, and say they're seeking the truth from police, who initially said that he was armed and forced a standoff with police. Stokes was shot twice in the back on July 28, 2013, in the Power & Light District after an intoxicated Johnson County man told police Stokes’ friend had stolen his cellphone. After police chased Stokes and two other friends from the entertainment district, Stokes was killed while trying to get into a car in a parking lot at 12th and McGee streets. A federal lawsuit filed by Stokes mother, Narene, and his daughter, Neriah, says police created a “false narrative” — that Stokes didn’t commit a crime, didn’t have a weapon and was surrendering to police when he was shot. “Our patience has worn thin,” Curtis Taylor, Stokes' uncle, told commissioners Tuesday. Narene Stokes (center), Ryan Stokes’ mother, watches testimony about her son’s killing during the Kansas City Board of Police Commissioners meeting Tuesday. Sitting to her left is Dawn Oliver Dysart of One Struggle KC. The lawsuit seeks an accurate recounting of the shooting, changes to the department’s policies on foot pursuit and notification, as well as an apology from Officer William Thompson, the 21-year veteran who shot Stokes. 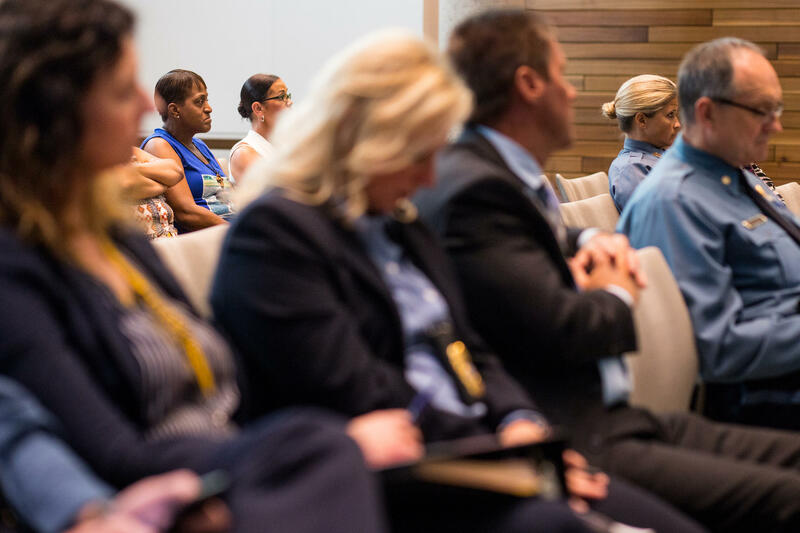 “Regardless of the circumstances of the event that lead to the use of deadly force, compassion from this department would have gone a long way in our worst hour,” Taylor said. Dawn Oliver Dysart, an activist with One Struggle KC, said it was especially galling that Thompson and his partner were given a commendation from the board a year after the shooting. The family’s lawsuit also asks that the board rescind the commendations. “In 21st-century America, all it takes is one trigger-happy officer bred in a militarized police force or the word of one white person to put the life and liberty of black bodies at risk,” Dysart said. Nathan Garrett, one of the commissioners, said he valued learning about Stokes but that he couldn’t comment on the case because of the lawsuit. Officer-involved shootings – either justified or unjustified – “that’s something that we mourn and that we regret,” he said. “Regret is an unsuitable word when it’s your loved one who has been harmed, so I fully understand,” Garrett said. Peggy Lowe is an investigative reporter at KCUR and is on Twitter @peggyllowe.